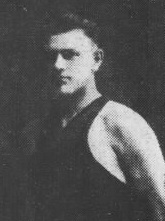 George “Babe” Artus began his career with his hometown Paterson Crescents. A powerfully built man, Artus was one of the premier defensive players of his era. A relentless performer, he was always ready to mix it up and was quick with his fists. Artus was also a capable offensive player and good passer. Like many stars of the time, he was a basketball vagabond. He performed for over a dozen teams during his fourteen year career. He played in the Pennsylvania State League, New York State League, Metropolitan Basketball League and starred for five seasons in the American Basketball League. He appeared on the roster his hometown Paterson team for parts of seven different seasons.